We provide SAP Food & Beverage Solutions. Whether you are a food & beverage manufacturer, a wholesale and distributor, or a retailer, you face a set of challenges that are unique to your sector. Not only do you have tough regulatory requirements, but you also operate in an industry where time is often of the essence. You have a thin line between profit and loss if you fail to tightly control import costs, manufacturing and staff efficiency, pricing and wastage. In our experience, our SAP Food and Beverage Solution, built on SAP Business One is invaluable; it delivers visibility and control where you need it and drives process, stock, compliance and sales efficiency. Codestone have been highly professional in understanding our business needs throughout the whole project. We are confident that if we need any assistance, they will be there and able to help. SAP Business One enables you to take control of what is important for your business, whether that be manufacturing, packaging and batch management, stock control and distribution, pricing and multi-currency or comprehensive financial management from order to cash. With SAP Business One we drive additional efficiencies by integrating processes across your complete supply chain. We connect sales, stock, production, packaging and distribution to reduce time from order to delivery. By aligning supply and demand, we reduce wastage and by breaking down silos we increase productivity. We enable you to take regulatory compliance in your stride, making it an integrated and automated part of your processes. SAP Business One electronically captures and manages batch numbers, tracks ingredients and enables you to fully control the packaging and labelling of your products. With SAP Business One you place financial management at the heart of your business with data collected at source and providing a real-time accurate picture of your entire business. You are able to take complexity in your stride including multiple currencies, tax rates, suppliers, ways of manufacture, methods of distribution and customers. SAP Business One allows you unprecedented insight into your business providing you with real-time visibility of what is important to you. It enables you to track key performance indicators, identify which parts of your business are generating the best returns and to address issues before they become business-affecting. 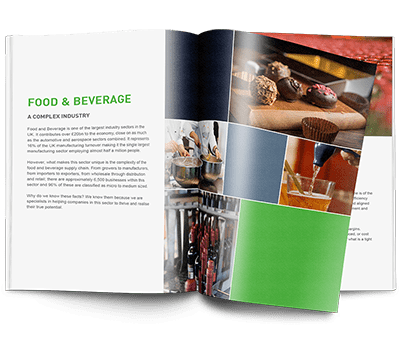 What SAP Food and Beverage Solutions can do for your business with our eBook outlining the key capabilities and value. SAP Food and Beverage Solutions enables you to improve every area of your business. By streamlining every aspect of your supply chain, automating labour intensive tasks such a trace-ability and electronically flowing data across your business. By accurately aligning supply and demand, maximising customer relationships and reducing wastage across your business. By reducing the complexity, providing comprehensive business insight and addressing those operational issues that restrict growth. We looked at a number of things when selecting an implementation partner: cost, capabilities, services and so on. But it was our shared values that made Codestone stand out for us.